One of things our technical experts observed was that our clients were using cowdung as microbial culture in their anaerobic system. However, we have observed that microbes present in cowdung are never efficient enough to effectively degrade wastewater. Sure enough, that was the case here too. To further compound matters, MLSS levels were low in both the bioreactors and optimum MLVSS:MLSS ratio was not maintained. And even though they were already using a microbial culture to treat wastewater in their aeration tanks, it was not efficient at reducing the COD load. After an in-depth study of the plant and analysis of the problems, our experts decided to bio-augment both the systems. Our objective was to reduce COD loads, in line with Pollution Control Board (PCB) norms, and to stabilize the biological unit for effective plant performance. Our recommended solution was a combination of CleanMaxx (for their aerobic system) and CleanMaxx ANB (for their anaerobic system). CleanMaxx is a tailormade, heterogenous consortium of beneficial and robust microbes, isolated from nature. The microbes secrete effective enzymes which are completely natural and safe to humans, plants and animals. CleanMaxx ANB is a variant of CleanMaxx, specially designed for anaerobic systems. CleanMaxx ANB provides a continuous source of highly anaerobic and facultative cultures which stabilize the system. The microbes break down complex organic matter into volatile acids and the volatile acids are further broken down into methane and carbon dioxide. The results of our intervention were immediate, measurable and impactful. The effective microbes present in CleanMaxx steadily degrade organic pollutants and this leads to reduction in COD/BOD levels in the wastewater. Within two months, we observed a 95% reduction in COD while BOD was reduced by 93%. After bio-augmentation, MLSS levels were also significantly improved in the biological system. There was no more fluctuation in MLSS levels and the desired MLVSS:MLSS level of 0.7 was attained and maintained steadily. 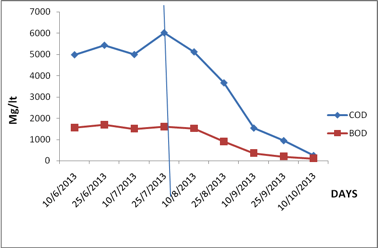 Before addition of CleanMaxx, MLSS was in the range of 2000-2200 mg/lt. 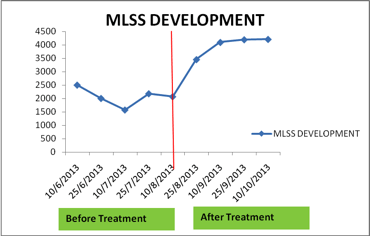 After treatment, MLSS levels rose upto the range of 4000-4300 mg/lt and MLVSS was in the range of 2550-3000 mg/lt. And lastly, our treatment was also effective in significant levels of odour removal. After all, this was not just a routine project we were on here. This was all about ensuring the taste of India.